(b) the readings of the ideal voltmeters V1 and V2 and compare those values. Faraday's law, conservative and non-conservative electric fields. We are supposed to find the induced electric field. An induced field is non-conservative. F = BA, ∂F/∂t = A∂B/∂t = 0.1 Tm2/s = 0.1 V.
I = emf/R = 0.1 V/(5 Ω) = 0.02 A. (b) Both voltmeters reads zero. E is an induced field and not conservative. (a) Assume ∂B/∂t = ∂B/∂t k for r < R and ∂B/∂t = 0 for r > R. Find the electric field everywhere. Is E conservative? (b) Now assume a uniform, circular conducting ring, of radius R1 > R, is placed in the field you found in (a), concentric with the origin. The conductance of the ring is σ. Place voltmeter leads on the ring (see figure below), separated by an angle θ. Plot the reading of the voltmeter as a function of θ. Assume an ideal voltmeter, with leads placed so that no flux cuts the circuit defined by (leads + ring). (a) ∇×E = -∂B/∂t, ∮Γ E∙dr = -∂/∂t∫AB∙n dA, ε = -∂F/∂t. ∂F/∂t = 2πrE = -πr2∂B/∂t for r < R, ∂F/∂t = 2πrE = -πR2∂B/∂t for r > R.
E = -(φ/φ)(r/2)∂B/∂t for r < R, E = -(φ/φ)(R2/(2r))∂B/∂t for r > R.
E is an induced field and not conservative. (b) In the ring we have E = -(φ/φ)[R2/(2R1)]∂B/∂t. E + ∂A/∂t = -∇Φ. B = ∇×A, B = B k for r < R, B = 0 for r >R. Let A = Aφ(r)(φ/φ), then B = (1/r)(∂/∂r)(rAφ(r)) for r < R, Aφ(r) = Br/2. For r > R, 0 = (1/r)(∂/∂r)(rAφ(r)), Aφ(r) = const/r. Since Aφ(r) is continuous, const = BR2/2. At r = R1 we have Aφ(R1) = BR2/(2R1), ∂Aφ(r)/∂t|R1 = (∂B/∂t)R2/(2R1). E + ∂A/∂t = 0, ∇Φ = 0. V = constant, ∆V = 0. The ideal voltmeter reads zero, independent of the angle θ. 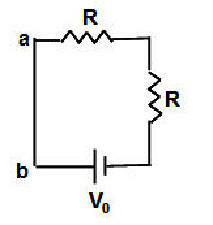 Consider the square circuit shown in the figure below, with a battery with potential V0 = 1.5 V and two identical resistors with R = 1 kΩ. Each side of the square has a length of 50 cm. (a) Find the current I0 flowing in the circuit. Determine the potential of point a with respect to point b, i.e. Vab. Does ∫abE∙dr depend on what path you take along the circuit? (b) Now consider the same circuit but without the battery. A uniform magnetic field of magnitude B0 is perpendicular to the plane of the circuit and points out of the page. The circuit cannot be moved or deformed. At what rate (magnitude and direction) does B have to change to produce the same current I0 as in the circuit in part (a)? (c) When a current I0 is flowing in the circuit in part (b), does ∫abE∙dr depend on what path you take along the circuit? Explain! An induced field is a non-conservative field. (a) I0 = (1.5 V)/(2*103 Ω) = 0.75 mA. Vab = 0. ∫abE∙dr = Vab = 0. It does not depend on the path. (b) (dB/dt)*(0.25 m2) = 1.5 V. dB/dt = 6 T/s. (dB/dt) points out of the page. The magnitude of B is increasing. (c) The induced field is not a conservative field. A potential and therefore a potential difference is only defined for a conservative field. The potential difference Vab = 0. ∫abE∙dr depends on the path along the circuit. ∫abE∙dr = 1.5 V ccw, ∫abE∙dr = 0 V cw.